The Sour OG hybrid strain is a cross between OG Kush and Sour Diesel. 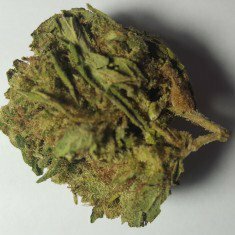 It is a Sativa/Indica strain which combines to produce impressive THC levels which range from 17% – 20%. Sour OG’s buds are broad, thick, and sticky, with moderate trichome coverage. It has an olive green color, speckled with bright orange hair. As a hybrid between two of the most popular strains in the world, the whiff and taste express an equal mix of both parents. It combines the scents of sour lemon, pine, and pungent diesel to produce a distinct, inviting fruity note. Sour OG is the perfect hybrid strain for those who love a balanced sativa/indica buzz. Often described as a “one-hit-quit” strain, the Sour OG starts you with an energetic burst, hitting instantly to provide an extremely social, positive, and uplifting high. This creative cerebral sensation is balanced out by a coordinated, relaxed mood. Sour OG is a strain used in cannabis oils and other edibles. Its strong dank odor indicates its potent medicinal properties. When consumed for recreational purposes, it gives the happy, relaxed, euphoric, uplifted, and energetic feeling. This bud is good to pass around while having a smoke circle with friends. Its energizing mental effects provide you with a substantial boost when engaging in a creative activity such as painting. Medically, it is used in the treatment of depression, acute pain, stress, headaches, general debility, anxiety, and post-traumatic stress disorder (PTSD). The sativa/indica ratio of this strain is 50%:50%, which makes it suitable for daytime use. With its light contrasting colors, enticing aromatic scents and versatile medical and recreational uses, Sour OG remains one of the most handy hybrid strains in both medical and non-medical fields. So nice, perfect and favorite hybrid strain. Sour OG is my number 1 strain!! love it!!! Very tasty hybrid. Highly recommend. This stuff really hits the spot. Potent, uplifting high. Awesome!!!! Its very good. i like it. What a lovely strain! So nice! !